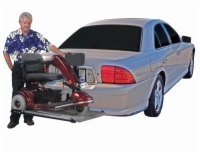 The Universal Scooter Lift is one of Harmar's most popular vehicle lifts because of what it brings to the table. This includes a 350 pound capacity, and automatic hold down arm, a corrosion-resistant aluminum deck, and a 3 year transferable warranty. This lift is easy to use and you'll surely be using it for years to come!